Launch your career with a winning resume. Move up the ladder. We'll create a brilliant resume for you. Open doors by showcasing your management leadership skills. Rise above the rest with a compelling presentation of your success. Resume Writing Services Give a Headstart to your job search. Increase your chances of finding the right job to meet your career aspirations through a well written and well presented resume. In-house team of experts who among them are from IIT & IIM. Get the resume draft in 2-3 working days. 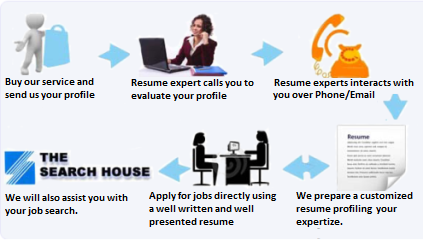 Why choose our experts to write your resume? We will highlight what we believe employers look out for. We will ensure you don’t over sell or undersell your profile. We will give your resume a reader-friendly professional design. We will help you articulate your contributions, achievements, accomplishments and strengths. We will help you highlight your past performance which is the best indicator to an employer of what your future performance is likely to be. The Process we follow to get Top Results!